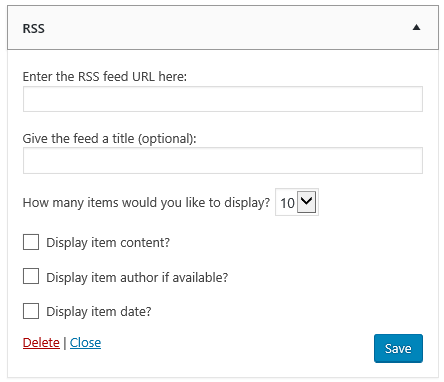 RSS is used to display RSS feed from any website in your blog’s sidebar. Enter the RSS Feed URL here: The RSS feed URL for the website. 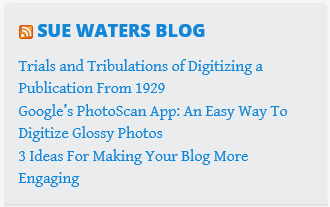 Feed URL on a website is normally indicated by the orange RSS icon or the words RSS. Give the feed a title: Allows you to add your own custom title. For example, Latest Science news. How many items would you like to display: Controls the number of items displayed. Show item content? : When checked it displays an excerpt of the post content. Show item author if available? : When checked it displays the post author. Show item date? : When checked it displays the date the article was published.